One of the best things about Thanksgiving is a fridge stocked with mouth-watering leftovers. But how long can you safely graze on them? Find out below, then try these memorable 10 recipes that will transform those leftovers into delicious, inspired new meals. —According to the USDA, cut leftover turkey into small pieces; refrigerate stuffing, turkey, sides, and sauces separately in shallow, airtight containers within two hours of cooking. Smaller, shallow containers help foods cool faster. Your refrigerator should be set to 40 degrees or below to ensure safe storage. —Eat refrigerated leftovers within four days, says Mayoclinic.com. If you don’t think you’ll finish the leftovers by then, freeze them immediately. —If freezing leftovers, use within two to six months, says the USDA. Canning hopefuls will find plenty of guidance in this trove of culinary wisdom including chapters on canning, salting, smoking and drying; jellies and preserves; and pickles and relishes. There are also useful tables for processing times, boiling temperatures and moderating the levels of sugar in the preserving syrup. This classic baking book is chock full of delightful dessert recipes that are perfect for the holidays, including Chocolate Layer Cake with Chocolate Fudge Frosting and Chocolate Dipped Bananas. Seventy-five years ago, a St. Louis widow named Irma Rombauer took her life savings and self-published a book called The Joy of Cooking. Her daughter Marion tested recipes and made the illustrations, and they sold their mother-daughter project from Irma's apartment. 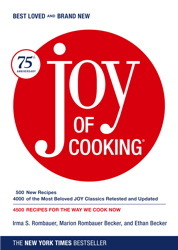 Today, nine revisions later, the Joy of Cooking—selected by The New York Public Library as one of the 150 most important and influential books of the twentieth century—has taught tens of millions of people to cook, helped feed and delight millions beyond that, answered countless kitchen and food questions, and averted many a cooking crisis. JOY remains the greatest teaching cookbook ever written. Reference material gives cooks the precise information they need for success. New illustrations focus on techniques, including everything from knife skills to splitting cake layers, setting a table, and making tamales.